Our food is becoming more and more complex. By that I don’t mean food preparation, but what goes into our food and what it’s made up of. Even the simplest foods have ingredient lists that seem to go on forever. Not all additives are harmful, but some of them are dangerous to our health and well-being. Find out what’s good for with the What Additives app! Our society has progressed immensely in a fairly short period of time. Whether it’s our society, technology or music – things are changing extremely fast. Unfortunately, progress isn’t always a positive thing. Sure, I love my new smartphone and table and the internet plays an essential role in my life. At the same time, there are some changes, especially in the food industry, that make me more than uncomfortable. Setting aside the debate about genetically-modified products, I would like to concentrate on the issue of food additives in today’s test report. Consumers have high expectations when it comes to food. It has to taste good, look good, last long and be easy to prepare. In the last couple of decades, agricultural chemistry and biotechnology have been used to reach these goals. A lot of these food additives – whether artificial or natural – have a strong effect on the human body. I’m not against all food additives, but I think consumers have the right to know what’s being put in their food – something that is nearly impossible to know without relevant information. That’s where the What Additives comes in – to help you become a more informed consumer. Even with the additives that have been deemed safe for consumption it is important to inform yourself on any possible side-effects. Although it is legal to consume alcohol, drinking too much at once can negatively affect your health. Whereas in Europe there has definitely been a strong tendency to fight against unhealthy food additives, the United States does a much worse job at regulated the food industry. So enough politics from me and let’s puts What Additives to the test! Citric Acid E330: Regulator, vegan and safe for kids. A weak organic acid that occurs in the metabolism of virtually all living things. No know adverse effects. Using this information, I can tell that E330 isn’t half as dangerous as it sounds. Sodium citrates E331: Regulator, vegan and safe for kids. Sodium salts of citric acid. Commercially prepared by fermentation of molasses with the mould Aspergillus niger. No know adverse effects. Potassium sorbate E202: Preservative, vegan and safe for kids. An antifungal and antibacterial preservative, manufactured by neutralization of Sorbic Acid (E200) with potassium hydroxide. No know adverse effects. Potassium benzoate E212: Preservative, vegan and attention with kids! The potassium salt of Benzoic Acid. 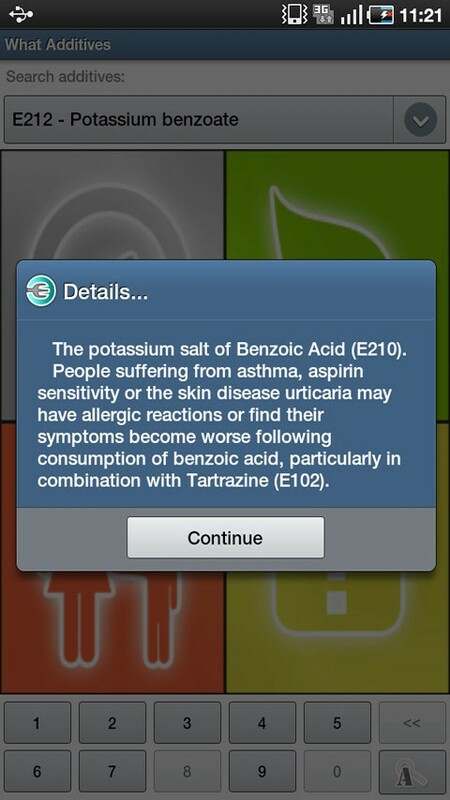 People suffering from asthma, aspirin sensitivity or the skin disease urticaria may have allergic reactions. It’s really interesting to see how much different stuff is packed into one small mixdrink. Thanks to What Additives I’ve informed myself about the possible dangers related to the potassium benzoate (E212). Now I’ll know to keep this additive away from children and people suffering from asthma and other medical conditions. It’s not the functions that make What Additives great, but rather the amount of information it provides. You can search for additives by number (most commonly used in the EU) or by name (more typical for the US). I would have enjoyed seeing some more information pertaining to the way in which each additive is used. Nevertheless, the app is both informative and practical for conscientious consumers. What Additives is really easy to use. 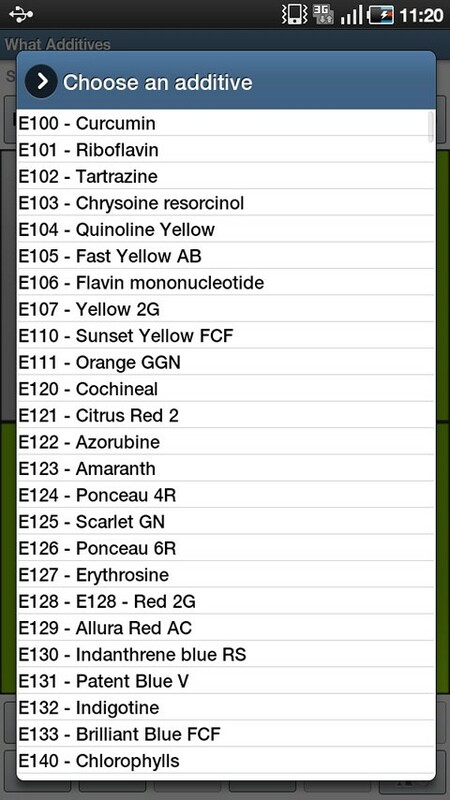 You’ll find a scrollable list of additives with numbers and names at the top of the screen. At the bottom you, you can search for additive by entering in the number or name. 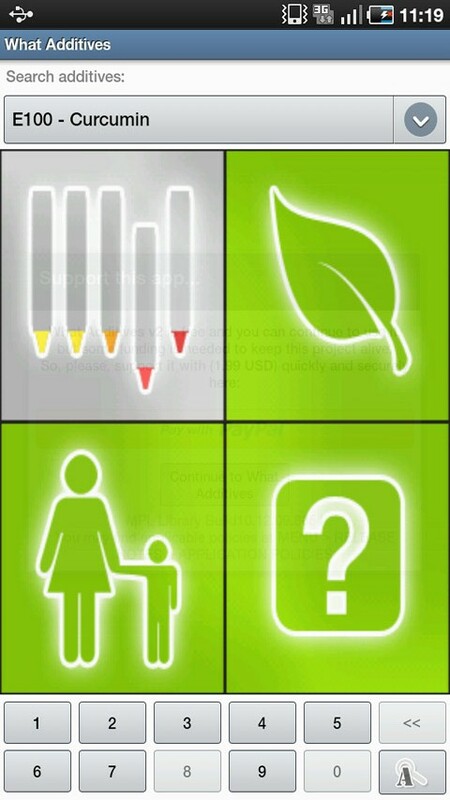 Four large icons show you all the most important information related to the additive. When the icons are green, it means that the additive is both vegan and safe. Red is warning sign for animal products and potential health hazards. Clicking on each icon gives you more details. The app is definitely not eye candy, but clear and simple to use. 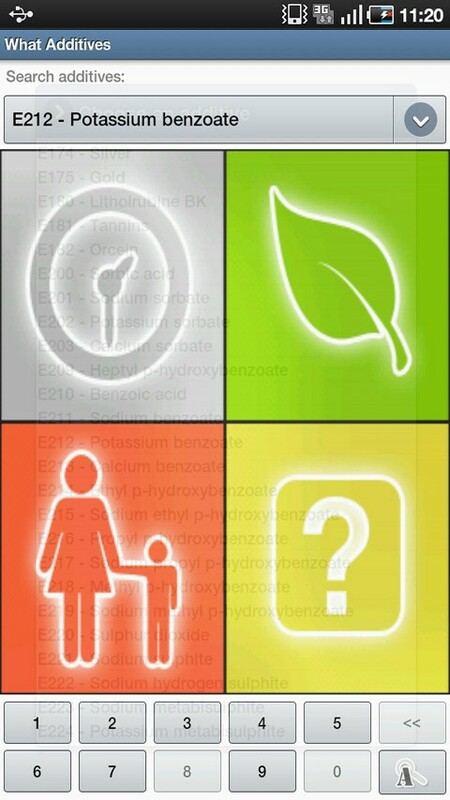 What Additives can be downloaded for free from the AndroidPIT App Center. You'll be prompted to purchase the donate version after every start-up. The list of additives is long, and grows daily. It is useful to know what effects additives have, what foods contain additives and especially how additives affect our health.